Herman “Rudy” Corrado and Norma Manzardo grew up in the Chicago area. Their parents came to this country from northern Italy. Norma, her sister and two brothers lived mainly with their mother. “Because of an early divorce, she worked at anything to keep us going, even in a defense plant putting ailerons on B-24s,” Norma recalled. “We met at a roller-skating rink in Chicago. I thought she was kind of cute, but she liked the monitor of the rink. I told him if he didn’t have honorable intentions toward her, he better leave her alone,” said Rudy, age 25. She was 20 when they married in 1943. Their route took them through the dark war years and to numerous areas of the country. 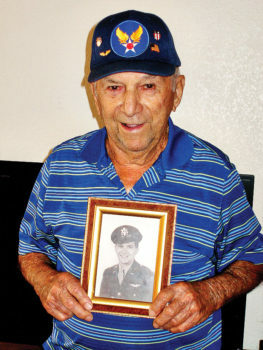 In 1942, Rudy began his training for an Army Air Corps pilot. He was at many places before assignment in the Philippine Islands. By then, he was flying the huge B-24 four-engine bomber with a crew of 12. Their mission was to bomb the oil fields around Borneo and the Philippines. “The pilots in the European theater had it much worse. We had little opposition,” he remarked. After 37 raids, he traveled to Okinawa to prepare for bombing Japan. When two atomic bombs dropped on Japanese cities, no further bombing was necessary. In July 1945, running out of fuel and down to one engine, the crew bailed out into the Philippine Sea. Last to leave, Rudy leaped through the open bomb bay door. All landed safely and were rescued after two hours. He received an Air Service medal and The Caterpillar pin, given to airmen who had to parachute. Norma was the one to find housing where they were sent. “I would knock on doors asking if there were spare rooms.” She also picked up jobs to help with the meager income. “I was the world’s worst waitress,” she admitted. Later, she was employed as a secretary. Rudy was a self-employed auto mechanic for 40 years until retirement in 1983. They also once owned a furniture store in Scottsdale and lived for 20 years in the Verde Valley. Wickenburg, where the couple also lived, once displayed Rudy’s war mementoes in their museum. He was once a serious golfer until his eyesight worsened. Norma belonged to Kare Bears. Both helped found our Italian Club. They’ve enjoyed bus trips and the theater. Reliable sources report Rudy can cook up some tasty Italian dishes. Enjoy a cup of coffee in the home of this interesting, gracious couple and discover both are truly young at heart. 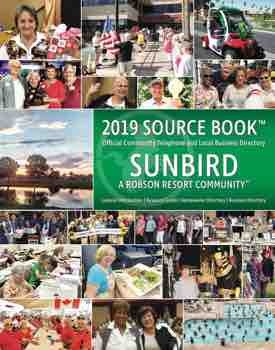 Author’s note: It seems appropriate now and then we recall and acknowledge those who once walked among us at SunBird. The Honor Flight to Washington, D.C., was his biggest thrill. This article appeared in 2014, and both are now deceased.